GBA Dora the Explorer: Super Spies (USA) in 22:57.41 by EZGames69. Señor Tucán, a master super spy, has a special mission for super spies Dora and Boots: Race to Tico's workshop to warn him of Swiper's plan to swipe his new rocket car. 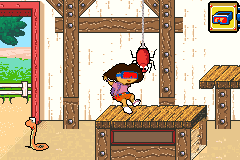 In this dangerous adventure, Dora and Boots need help from their friends, Backpack and Map, and the player. To help them, the player must find spy briefcases that contain special spy gadgets, such as spy glasses, rocket sneakers, a rope launcher, and more. The player will need these items to explore levels ranging from a rainforest and a garden to a desert and a cavern. Thanks to EZGames69, Swiper was stopped from stealing Tico's car in just under 23 minutes, which was far sooner than Swiper could ever have anticipated. Oh, man!